The relative camera memory speed and pixel capture rate is very similar between these two behemoths but you have to give the crown to the i-SPEED 726 for the 3 megapixel 8,512fps which brings in a whole new level of temporal detail at above Full HD resolution. 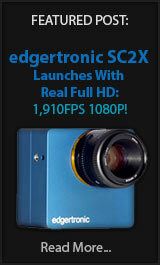 Of course, these cameras do not share their pricing unless you request a quote which you cannot share publicly. However, expect to pay high 5 figures for the best the technology has to offer. With a large sensor at 13.5 μm pixels and near 35mm diagonal it becomes a very good low light performer which is essential for high-resolution cameras that shoot high frame rates but don’t want to sacrifice image quality due to the artifacts caused by smaller pixel sizes. The mounting support is very good with both Canon and Nikon F+G mounts supported and the C mount option if needed. This is an ideal camera for wildlife documentarians and filmmakers who need the next level of frame rate performance for their productions. As you can tell from the samples above the camera with its 12 bit recording and 36bit color is producing clean and gorgeous files. To be expected considering the enormous data rates of 38.4GB/sec at full 3MP and 8,512fps necessary to record these speeds. The internal 96GB of memory will fill up after 2.5 seconds of recording at the maximum resolution and speed 3MP – 8.5kfps so you will need to offload to the memory mags to continue your testing. 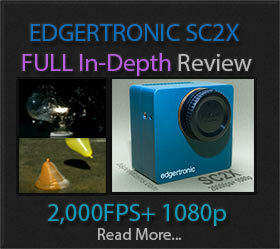 There is no denying that a camera like this is overkill for the common videographer and an edgertronic SC2X with 1080p at 2000+fps (Full Review Here) should suffice most users at a considerably lower entry point for full HD. Previous PostOnePlus 6T Official Slow Motion Video Released!Next PostDouble Your Camera Slow Motion Frame Rate For Real!